The article describes progress on the problem via study of ‘optimal’ billiard tables, “shapes whose particular angles make it possible to understand every billiard path that could occur within them”. New Shapes Solve Infinite Pool-Table Problem, Quanta Magazine. The London Mathematical Society yesterday launched its Mathematical Sciences Directory (LMS MSDirectory), a directory of mathematical scientists in the UK. Entries include some personal information, academic networks and social media, current employment and information on education/qualifications. Yes, it’s yet another place to list all this information. 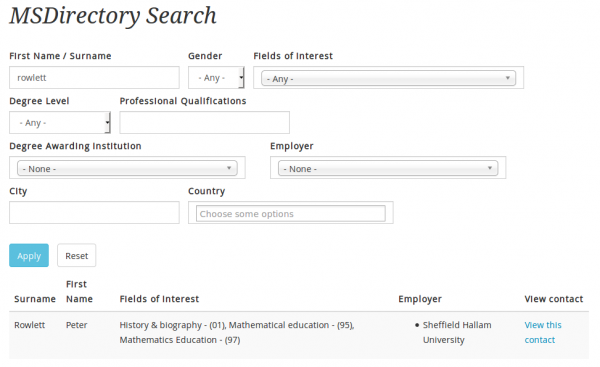 The LMS website suggests a set of benefits for being on the list, including networking with others in UK mathematical sciences and the opportunity to contribute data anonymously to projects such as the Mathematical Sciences People Pipeline, which are used “to make representation to national policy-makers regarding the mathematical sciences”. Those eligible to be listed include people with a maths degree from a UK institution, those currently working in mathematical sciences in the UK with or without a maths degree, and current students. You don’t have to be an LMS member to be on the list. The FAQ suggests the list was initially populated with data from “over 5,000 mathematicians” (though some may have opted-out before launch – they first emailed me in March asking me to check my data or opt-out) and people can opt to join. Further details and information on how to join the list from the LMS. You may have heard of the replicability crisis in science, and practices like outcome switching and p-hacking. BuzzFeed reports on a paper that proposes a solution: rather than assign statistical significance at $p=0.05$, change this value to $0.005$. Sir David Spiegelhalter is quoted saying: “Dealing with the size of the p-value fixes some things. But it’s not dealing with the most important issues.” There’s a lot more in the BuzzFeed article and the full paper. PsyArXiv preprint: Redefine statistical significance. BuzzFeed: These People Are Trying To Fix A Huge Problem In Science. Once upon a time (2011), there launched an online LaTeX editor called ShareLaTeX. The very next year, there launched an online LaTeX editor called writeLaTeX. In 2015, writeLaTeX rebranded as Overleaf. Both Overleaf and ShareLaTeX offer browser-based LaTeX editing. Think of it like Google Docs for LaTeX. Both operate under a freemium model. If you use one of them, know that the other is fairly similar. If (like me) you were vaguely aware that there was an online LaTeX editor out there without using it, it was probably one of these or the other (or, I’m pretty sure, both at different times). Though note that these are not the only browser-based LaTeX editors – a native operating system ‘B’ means browser-based in this Wikipedia list of TeX editors and there are currently ten Bs in the list. Recently, Overleaf fully acquired ShareLaTeX (Scribtex Limited) and plans to integrate the two products into one. The announcement says everyone from both teams will continue to be involved. The announcement contains more detail, a FAQ list and the following explanation. Exciting News — ShareLaTeX is joining Overleaf on the Overleaf Blog. Also: ShareLaTeX Joins Overleaf on the ShareLaTeX Blog, which appears to be the same text. Via Emma Cliffe on Twitter. 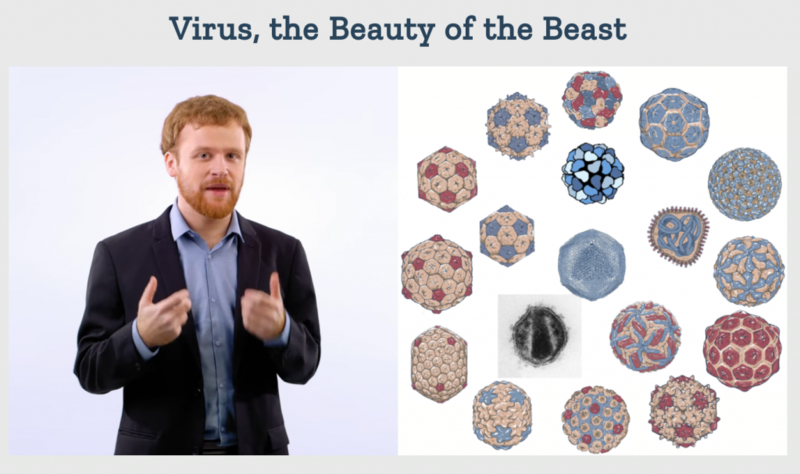 Hamish Todd offers Virus, the Beauty of the Beast, an interactive documentary about viruses. Viruses have protein shells made of patterns which can be explored mathematically, and this link to tiling theory and geometric shapes provides a mathematical interest for the piece. While studying maths I had learned about viruses, and about their connection to Islamic art, which amazed me. I found it staggering that such beautiful things could surround us without most people being aware of it. I wanted to let people see it, and I knew that my game design skills could help me do that. Apparently many viruses are arranged on what Hamish calls a ‘hexagons and pentagons’ structure (Caspar-Klug theory), and others have more exotic structures. Wikipedia says “most animal viruses are icosahedral or near-spherical with chiral icosahedral symmetry”, with other more complicated shapes also found. As well as “interactive documentary”, Hamish calls the website an ‘explorable explanation’, which aims “to let laypeople play with the beautiful things that mathematicians and scientists spend their time with”. Overall, it seems like a nicely-produced series of interactive videos exploring an interesting topic. Give it a go! Virus, the Beauty of the Beast, the interactive documentary. Virus, the Beauty of the Beast press pack. A symmetry approach to viruses, an article at Plus. Today is International Women’s Day, so we’ve taken a moment to think about the woman mathematicians in our lives. We each have fairly sizeable collections of maths books, which prompted CLP to wonder how many of them are by female authors. A quick scan of our respective bookshelves later, here’s what we found.